SHORT REVIEW: We had two great days with the weather being mostly kind at both of them. There will be a full report in our Autumn newsletter but we do want to thank everyone who helped out – the hosts, the experts who led the walks and helped with the identification, and the volunteers who manned the stall and welcomed visitors. There are too many people to list here, but a special thanks to our two moth trappers, Wendy Tyler-Batt at Great Crwys (who also welcomed us into her lovely meadow) and John Walshe at Kingcoed Farm (who gave a great demonstration despite having had very little sleep looking after the trap). We’ll work out a full credits list in due course! UPDATE: An additional site will be open on Sunday 8th June – Upper Red House Farm at Llanvihangel just 2.5 miles from the Middle and Great Crwys sites. This will be open from 1.30pm and we shall have maps available at Middle Crwys. This year our open days are combined with bioblitzes and will feature plant identification, butterfly and bird walks, and opening moth traps. 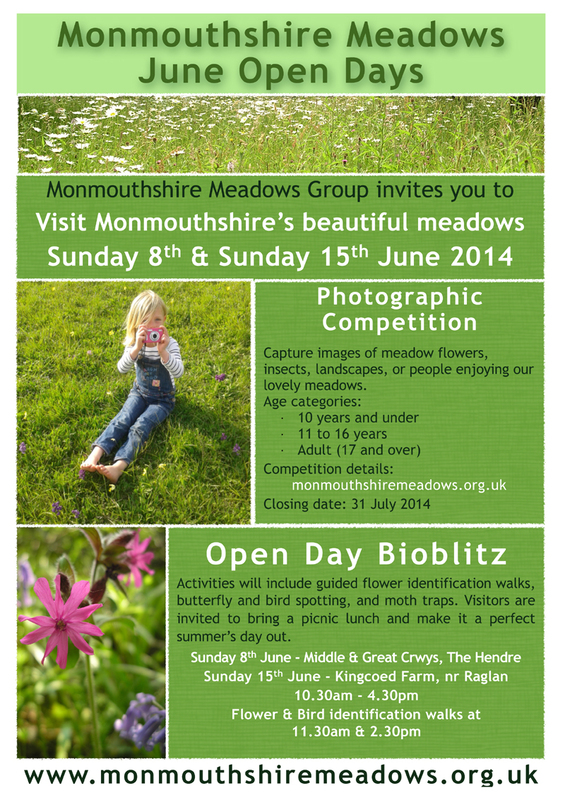 You can join in as much as you like – help record species as part of the bioblitz, benefit from our experts knowledge, or just come and enjoy the beautiful meadows. You are invited to bring along a picnic and join us for lunch. Many thanks to Paul, Alex, Simon, Tudor and Rachel for accommodating us. Moth traps will be set the previous night at both sites, and opened between 10.30 and 11.15 am. Moths will be potted-up and be available for people to see during the day. Experts will be on site on the 8th to open the traps and help with identification. The Middle Crwys site is a series of fields grazed by working Ardennes horses, some pastures on a south-facing slope and adjacent broad-leaved woodland; a small scrubby copse with some grassland. Great Crwys is a garden with a pond and some wild areas below the garden that are allowed to grow as a meadow. A range of plants occur at these sites. From the Hendre if coming from Monmouth on the B4233 Abergavenny road after the small cross roads in the village take the next turn to the right and continue on this minor road (ignore turning to Nant y Coy Farm); go past a wood and continue on until a right hand bend. Go around the bend and almost immediately at Upper Crwys at SO442157 is a turning to the left down a narrow track to Middle Crwys at SO440160 on the left; further down the track which you can walk is SO439162 Great Crwys. There will be MMG signs. Kingcoed Farm meadows were in a Tir Gofal agreement and have gradually become more species-rich with an abundance now of Spotted and Marsh Orchids. It is hoped an area of woodland and a wet pasture will also be included in the survey area. Take the small road from the Mitchel Troy to Raglan road near the tractor yard (at SO426085) before the road reaches the Raglan by-pass. Follow this minor road south over the dual carriageway and then slowly wind up a hill past two woods on your right. Just as you enter Kingcoed with the second wood on your right, turn left into Kingcoed Farm at SO427057 and park at top of field. This will be signposted.